This topic contains 2 replies, has 2 voices, and was last updated by Joseph Lutz 6 days, 14 hours ago. It is accepted that the Tirailleurs du Po wore “chapeau” (bicornes) during the Polish Campaign (1807) and the previous ones (1805 and 1806), but I would like to know if they wore bicornes during the 1809 Campaign too. I have seen some uniform plates that show this unit in bicornes from 1803 to 1811. But I am not sure about their accuracy. Could you give me some information about this matter? This site is useful I think? Le Plumet plates are very good for accurate information. 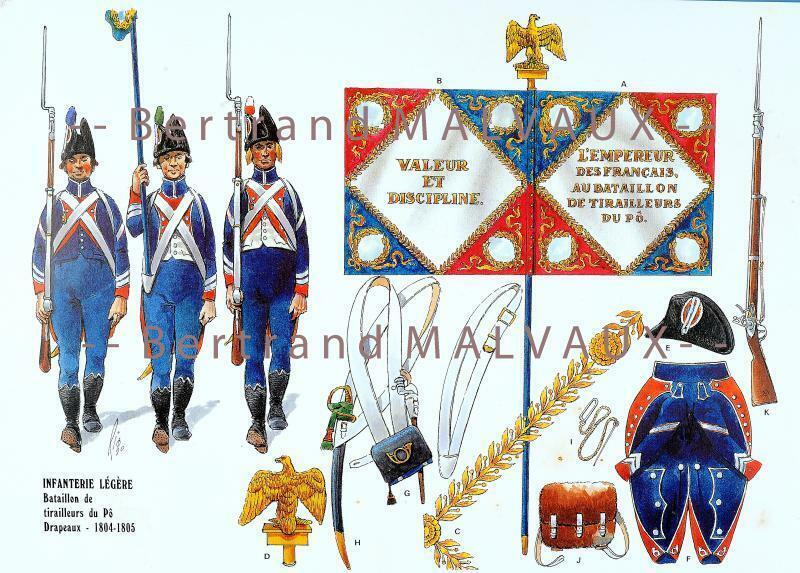 The Regiment “11e Tirailleurs du Po”, was born in april 1803 by some italian volunteers, most of them coming from Piemonte and from the collapsed Kingdom of Sardinia. 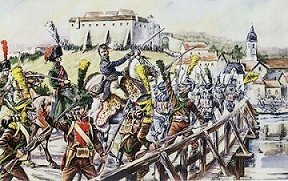 The first important battle took place just after they joined the Grand Armèe, when the Marshal Nicolas Jean-de-Dieu Soult, took them under his wing for the 3rd coalition war against the Austrian Empire, in which they’ll be remembered for Austerlitz Battle. But finally, in 1811, they became the 2nd “tirailleurs” french regiment; Sadly, the regiment takes part in Russia Campaign, falling in terrible losses. The Tirailleurs du Pô were formed in 1803 of northern Italians. According to John Elting “they rapidly became a crack battalion”. In 1811 the Tirailleurs du Po were incorporated into French 11e Regiment d’Infanterie Légère. The battalion was commanded by chef (not colonel): in 1803 – by Prince Borghese, 1804 – Cattaneo, 1805 – Hulot, and in 1809 – by Mano. Battle record: 1805 – Holabrunn and Austerlitz, 1807 – Heilsberg, 1809 – Herttingen, Reid, Ebersberg, Essling and Wagram. On this site pan down 4 pictures and you will see a picture of : Tirailleurs Corses and Tirailleurs du Po in Ebersberg. Tirailleurs du Po appear to wear shako’s. This reply was modified 1 week ago by willz. Thank you very much for the information. That uniform plate is really amazing.